Although wintry winds and the occasional snow storm still whistle through, warmer days are only a few weeks away and any stirring kernels of early spring hopes and visions for that possibly pretty bleak patch of garden can take hold. For many, planting plans are mentally taking shape as we can see from the many customer calls we’re taking at Garden Requisites’ HQ. In particular, all shapes and sizes of our trellis panels are flying out, many to garden designers who are flat out at this time of year, racing to get ready for the growing seasons. Feb is a fab time to assess the structure of a garden and measure up for any enhancing design elements. Wooden fences need reviewing for rot and storm damage. Galvanised steel trellis fences and posts can be considered as replacements, to eventually act as super sturdy, lifelong-lasting green walls of more wildlife-friendly climbing plants. 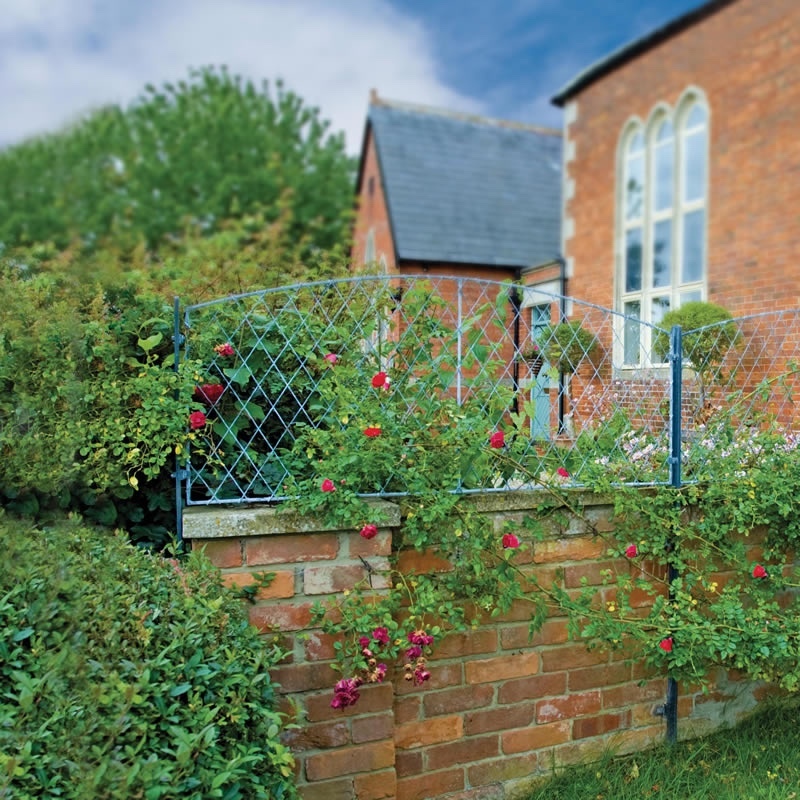 Walls too can support English wirework trellis, both on the wall face and on top to extend the growing height. Wall-top trellis can also prove to be useful shielding for ‘project nosy neighbour’! A green light to buy rampant climbers must be one of the highlights of the gardening year for foliage and flower fans, especially for those with smaller gardens or even just an expanse of wall. Focus on your preferences for colour, fragrance, foliage texture – evergreen or deciduous. This can also be a precious opportunity to improve on natural food provision and cover for local wildlife too. There are so many climbing plants to tick the box for trellis – for knockout summer fragrance, Trachelospermum jasminoides is a rapid-growing winner as are insect-friendly summer honeysuckles. For colour and floral interest, look to Clematis, climbing Roses and more unusual favourites like Runner beans, Akebia or Billardiera longiflora. Showstopping annuals like sweet peas can also be trained up and over – keep cutting the blooms and the blooms will keep coming. For more visual inspiration, do dive into our Climbing Plants Pinterest board. To tie in with any garden design theme or style, our weatherproof, zinc galvanised steel trellis comes in four finishes – Plain Zinc Galvanised, Aged Zinc Galvanised, Light Bark or Jet Black. Light Bark, for example, looks so smart against lighter-hued Cotswolds or Bath stone and classic Jet Black pleasingly offsets Victorian-style red brick in a town house garden. We can also arrange bespoke paint colours for your own unique look and, whilst straight edged trellis works for all properties, convex or scallop shapes may be more sympathetic to curvy or heritage layouts. Garden Requisites’ trellis panels are so simple to install, delivered worldwide in individual panel sections, and bolted to posts on wall faces or tops. If you have any concerns or questions about fixing to different building materials – brick, stone, timber – do have a chat with Hilary and team – experts in the art. Bring on spring and happy trellis training!